“Open, open the gates and let them remain open forever and let the King of glory enter,” the Archbishop commands during the consecration of St. John the Baptist in Ixcan, Guatemala. On April 22, 2018, the Church of Guatemala rejoiced at the consecration of the St. John the Baptist Orthodox Church in the Ixcán region of Guatemala. The church is located in the remote village of Los Angeles. Up until recently, people would have to go over mountains to reach the small village. Now, a bridge between the border of Guatemala and Mexico allows easier crossing into Los Angeles. Now in 2018, a grand Orthodox church stands proudly in that small village, offering a house of worship to the faithful in the Ixcán region. It began as a simple sketch back in August, though the idea of a church was conceptualized four years ago with a generous offer of sponsorship from Fr. John Rallis of St. John the Baptist Greek Orthodox Church in Des Plaines, Illinois. With the help of George Prosiliakos’s architectural expertise and Fr. Evangelios’s knowledge of the Ixcán region, Los Angeles was chosen to house the church. 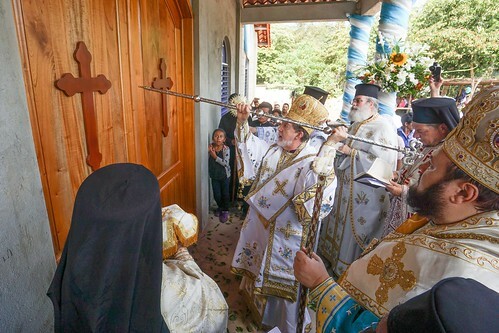 The consecration saw faithful from all over Guatemala come to share in the glory of Christ, while His Eminence Metropolitan Athenagoras of Mexico presided. On June 24th, St. John the Baptist Orthodox Church will celebrate the feast day of the Nativity of St. John the Baptist and Forerunner, intentionally chosen to coincide with and in honor of the ordination day of +Fr. Andrés Girón to the holy priesthood.